Learn everything you need to know about the client portal including quotes, invoices, contracts and questionnaires. The client portal is a client-only website that is created for each job that your client can access. Your client will be able to accept quotes, sign contracts, fill in questionnaires and pay invoices within the client portal. When a client first visits the client portal they will be greeted with an informational lightbox teaching them about how to use the client portal. This is where your clients can view and accept (or decline) quotes. Before accepting a quote, your client has the freedom to navigate around the client portal and review any other items that form part of the quote e.g. a contract or questionnaire. 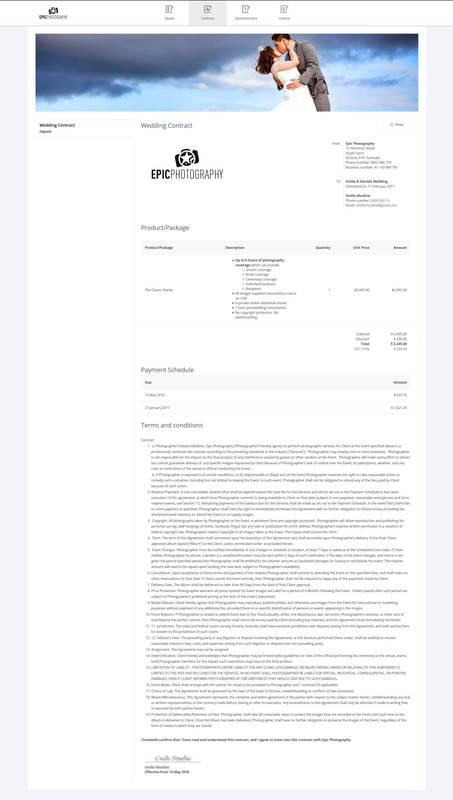 If a quote is accepted, that quote will automatically become an invoice. When your client accepts your quote, a quote wizard will guide them through the remaining steps of the quote, directing them to the contracts page, then to the questionnaires page and finally to the invoices page. Welcome to contracts, the Ninja way of handling cumbersome contracts! When you send contracts to your clients, they will receive an email with a link to this page. From here they can review your contract and sign it electronically. Say goodbye to the hassles of emailing a PDF contract and waiting weeks for your client to print, manually sign, scan and email it back. Now they can do it in a matter of minutes, all online, and you’ll get notified as soon as it’s done. Questionnaires are a great way of gathering insightful information about your clients. You can send a questionnaire to your client as part of a quote or on its own. You might want to send a client a questionnaire to get information you need about their wedding e.g. their best contact details, the addresses of where they will be getting ready as well as the addresses of the ceremony and reception. Of course, this is just one example. You can ask as many questions as you like! All the invoices that you send your client pertaining to their job will be stored here. Your client can easily access their client portal at any time to view invoices, see when they are due and of course, pay them via the different payment methods that you have previously saved. 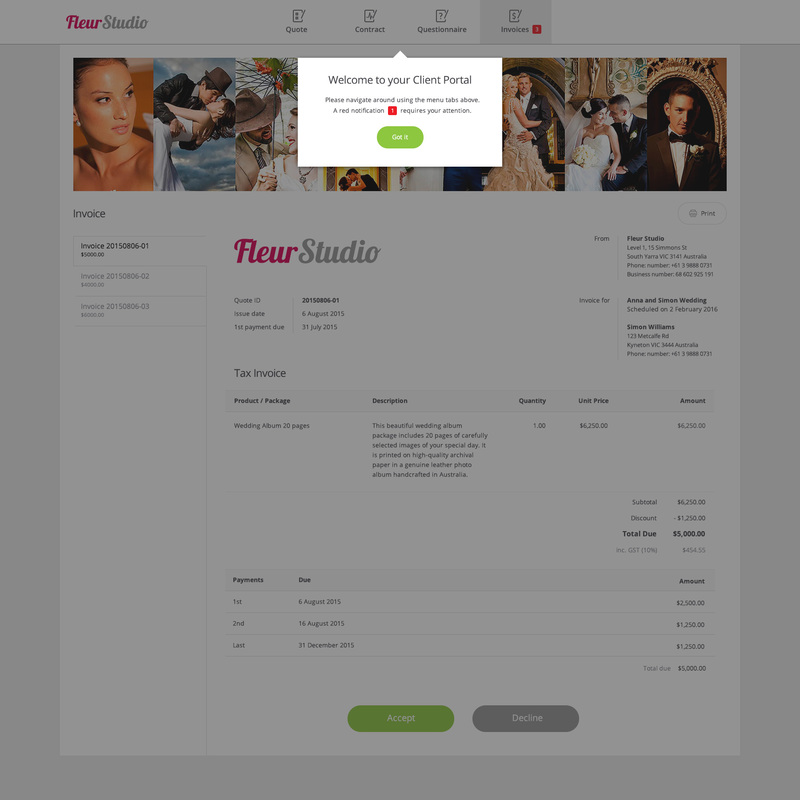 Payment methods that you have set up within Studio Ninja’s Settings will appear here. Click here to learn more about payment methods. If you have activated Stripe and/or PayPal, your clients will be able to pay online directly through the client portal with their credit card. 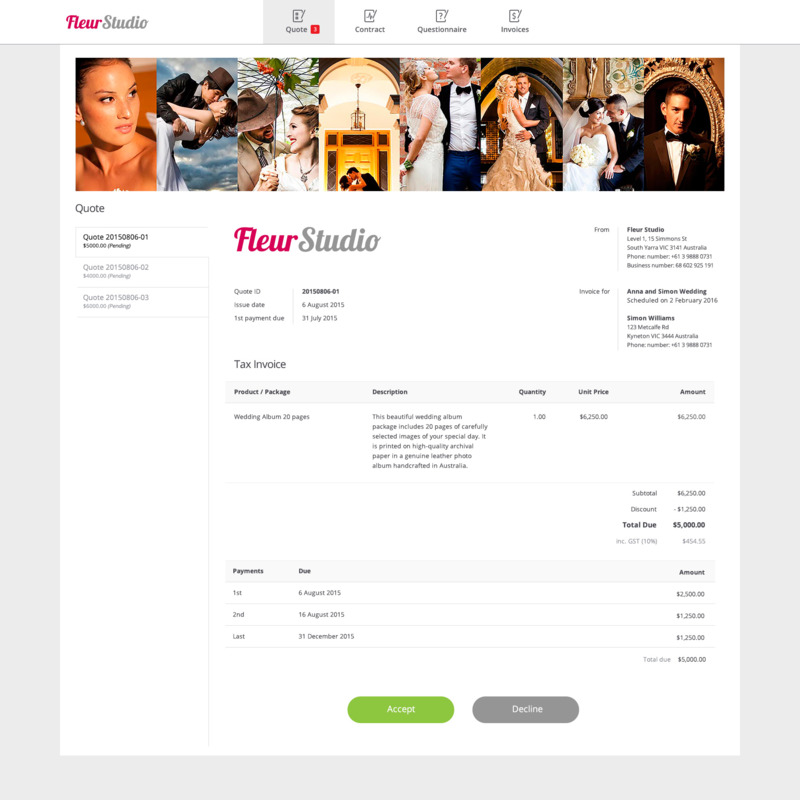 Once they have paid by credit card, Studio Ninja will automatically mark the payment as paid. Your client can also print the invoice to keep for their own records.